Discover Engineering Family Day aims to introduce 4 – 12 year-olds and their families to the wonders of engineering and the importance of technological literacy. 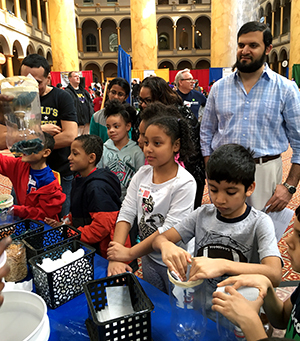 WSSC engineers had fun building water filters with future engineers! New this year, WSSC engineers will host college engineering students to experience “A Day in the Life of a WSSC Engineer.” Engineers representing different disciplines will make their work come to life by perhaps reviewing plans then touring the project site, showing the practical applications of classroom knowledge.